Manila, Philippines - [UPDATED] As early as midday on Wednesday, several local government units (LGUs) and schools in Metro Manila advise class suspensions for tomorrow, August 22 until Friday, August 23, 2013 as most areas remain flooded and impassable due to heavy rains. Though Typhoon 'Maring' is now outside the Philippine Area of Responsibility (PAR), it will continue to enhance Southwest Monsoon (Habagat) that will bring moderate to heavy rain showers and thunderstorms over Luzon particularly over the Western section. City Mayor REX Gatchalian on the Official website of Valenzuela City government has declared NO CLASSES from August 22-23, 2013 (Thursday and Friday) in Pre-School, Daycare, Elementary and High School both Public and Private Schools CITYWIDE including Pamantasan ng Lungsod ng Valenzuela (PLV) and Valenzuela Polytechnic College (ValPoly) due to flooding and continuous rain. Since August 26, Monday is an official holiday, CLASSES will all resume on August 27, 2013, Tuesday. Official Twitter Account of Makati City Information Department (MakatiInfo) tweeted: "Mayor Jun Binay has suspended classes in all levels in Makati -public and private- UNTIL FRIDAY to allow students, parents, and teachers to recover from the effects of the flooding." Mapua Official tweeted: " #walangpasok ADVISORY: Classes in Makati are suspended until Friday, 23 August 2013. Please be guided accordingly." 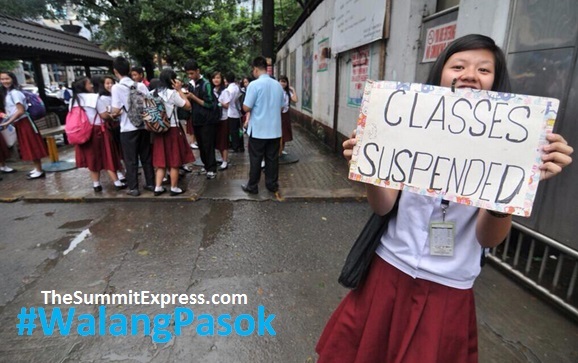 #walangpasok ADVISORY: Classes in Makati are suspended until Friday, 23 August 2013. Please be guided accordingly. Thank you. As of today, there is no tropical cyclone existing within the Philippine Area of Responsibility (PAR). The regions of Metro Manila, Central Luzon, Ilocos and Cordillera will experience monsoon rains which may trigger flashfloods and landslides. Cagayan Valley, CALABARZON and The provinces of Mindoro, Marinduque, Romblon and Mindanao will have cloudy skies with light to moderate rainshowers and thunderstorms. Palawan, Bicol region and Visayas will be partly cloudy to cloudy with isolated rainshowers or thunderstorms. Moderate to strong winds blowing from the South to Southwest will prevail throughout the archipelago and the coastal waters will be moderate to rough.